In 1993, photographer Gerard H. Gaskin embarked on a journey that would take him to various U.S. cities and into a subculture of queer, predominantly Black and Latino individuals known as the ballroom scene. These nighttime pageants are unique for gender-explorative categories, elaborate make-up and costumes, boisterous energy, and the sharp and elastic dance form known as voguing. 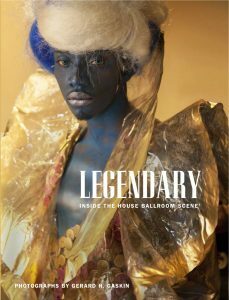 Legendary: Inside the House Ballroom Scene, an award-winning book that includes over ninety photographs, presents the fifteen years Gaskin spent documenting the culture. In 1990, Madonna’s hit “Vogue” mainstreamed voguing, and Jennie Livingston’s film of the same year, Paris is Burning, documented the scene from which the dance form emerged. However, both instances, many feel, overlook or fail to accurately communicate the complexities to which to attribute the scene’s distinct beauty. It’s these complexities that Gaskin attempts to address with his photographs. For those unfamiliar: participants competing in balls are often members of “houses” –familial collectives commonly named after fashion houses, i.e., the House of Blahnik or the House of Mizrahi. Each consists of a mélange of members––mothers, fathers, and children––that lend community and structure in the shadow of the socioeconomic marginalization queer people of color often face. Because of this marginalization, the scene has witnessed the deaths of many significant figures, remembered for their talents, innovations, and irreplaceable presence. In our conversation Gaskin recalled the passing of Paris Dupree, Danielle Revlon, Gerald LaBeija, Octavia St. Laurent, Jennifer Evisu, Arbert Santana Evisu, Eric Christian Bazaar, Marcel Christian and Mystery Dior. In his book, Gaskin pays tribute to the aforementioned and countless others, living and deceased, and shows us what it means to be legendary. Justin Allen: You went to your first ball in 1993. Where was it and what were your first impressions? Gerard H. Gaskin: It was in an after-school center behind Lincoln Center, and it was petrifying because there was this huge fight afterwards. I thought, If this is what it’s about, then I’m in trouble. The first year photographing the balls was difficult because Paris Is Burning had recently been released, and a lot of people had issues with the movie’s representation of the scene. I needed the community to say —We’re OK with you photographing. It took about a year to do that. It wasn’t smooth or easy, but did I want to do it? Yes. I saw Paris is Burning and disliked how it played with the idea that these people were interested in becoming white or wanting of white things. I feel it’s more complex than that. JA: How would you amend Jennie Livingston’s interpretation of the scene? GHG: The movie makes it seem like everybody is downtrodden. I wish it would have shown the people in the community celebrating themselves. That’s the complexity I’m much more interested in discussing and showing. This also isn’t to say, however, that the movie is completely off. I don’t agree with every aspect, but she made an amazing piece. The scene with Junior LaBeija is incredible, him talking about the culture. That’s real and that’s beautiful. But when she starts ad-libbing, that’s what I dislike. JA: You talk about this apprehension in ball participants to be documented. You were advised to ask for permission before photographing people. What were some initial reactions? GHG: People were resistant, so I shifted my approach. Douglas Says, who is a clothing designer and makeup artist, used to design clothes for the girls. All the major femme queens and transwomen of the day, especially of the early 90s, Douglas designed for them. Since he knew them, I started photographing portraits of femme queens. Others then allowed me into the scene. They were also mothers of houses at the time, so because I was ushered in by the mothers, I started developing relationships with the fathers of their houses, and they introduced me to their children. JA: Did having to ask for permission change the way you photographed? GHG: No, because I’ve always photographed with the same method. I need to be close to people. I want to be there long enough that they just assume I’m taking pictures, then they let their guard down and become more natural. I almost have a way of being invisible, but part of being invisible is being close. The closer I am, in some ways, the more invisible I become. JA: Many of the scenes you photograph capture moments of elaborate narrative. How do you communicate a story? GHG: I come out of a school called The Decisive Moment. There’s a really famous photographer named Henri Cartier-Bresson who coined this term that suggests that when all things come together, an image can tell so much—the idea that an image is worth a thousand words. I told you I try to photograph very close to the performers, and this is also because I feel the closer I am, the more information and energy I can put into an image. JA: How do you communicate a story compositionally? GHG: One way, I often play with the idea of simultaneous blur and stillness. Blur is excitement and masquerade. I’m trying to deal with these two ideas: blur that is mystery and fun, and the stillness of the focal point. It’s the image of Vanessa in the corner with the blonde hair, but it’s also the image where Danielle is blurred, pointing at Vanessa, so the viewer sees the energy of what Vanessa is doing. JA: Do you think your photographs make ballroom culture understandable to people unfamiliar with it? GHG: Understandable, yes. 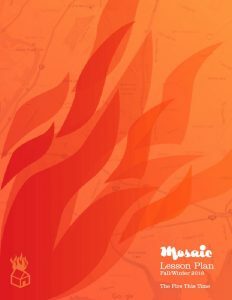 I want to celebrate the fact that this is a space that the community created, where they can deal with ideas that pertain to their lives without the judgment of the outside world. And who’s judging now? Participants are judging themselves. And that’s the fundamental reason I wanted to, with these photographs, comprise a book. Here’s a place that they created where they can play with sexuality and play with any role they want and be judged by their peers, not some outside entity. JA: You photograph balls in different cities and venues. How much do your photographs focus on physical bodies versus physical location? Do you find them both equally important? GHG: Spaces are important because they tell a history. If a ball participant sees an image from the Marc Ballroom in New York City, they know when the Marc Ballroom used to have balls. It was during a certain period of time. The same for, say, the YMCA in Philadelphia. There are specific places that used to have balls on a regular bases that don’t have them anymore. As for physical bodies, I focus more on people. My images are a history of the scene. A really amazing thing that Frank Roberts, who wrote the afterthought in the book, discusses is how a lot of notable figures in the scene have passed away. As people who have created the scene, that is what most interests me. Yeah, I’m interested in photographing bodies, but I’m more interested in photographing people who made the scene that is now a global phenomenon. JA: In 2005, you transitioned to digital photography. How does this differ from using film? GHG: When I shot film, I was much more cautious about shooting. Film costs a lot of money to buy and develop—much more than digital. And with digital I can just shoot haphazardly, and keep shooting and shooting then sort through the files and post them online and email them to the people I photograph. Back in the day, I had five rolls of film that had to last a whole ball—and I’m talking about a ball that would last about 10 hours. I’d shoot about 200 photos in one night. Now, I get a few cards and I shoot 600 to 1000 pictures in a night. But one of the reasons I started photographing digitally was because people started asking what it looked like in color, about the colors of the costumes. JA: You’ve also said you look at a lot of current magazines to keep up with photography trends. Do trends you see affect how you photograph? GHG: Always. I take a certain picture because I see the world a certain way, but it’s important that I know what other people are doing. I want to know what Annie Leibovitz is doing, or Herb Ritts. I want to see what André Leon Talley is putting in Vogue next month and who is shooting the pictures. I’m interested in how war and documentary photographers take pictures. It’s also important for me to see how young people see. A 20-something now sees the world differently than I see the world, with Facebook and the internet. That’s how I keep current and evolving. JA: Speaking of the internet, I know you’re familiar with Ballroom Throwbacks, which documents balls on YouTube and Facebook. Gifs, or moving images, taken from video footage of balls are also popular on such websites as Tumblr. With these more current modes of documentation, what makes photography distinct and important? GHG: I like a still image. Maybe that’s just me being an old-school person, but that’s what I grew up on. Not to say I’m not interested in other mediums, because I watch everything Ballroom Throwbacks puts out, and what they do is amazing in itself. But with a photograph, you need to put everything in that one still image. With a video you have more outlets to tell a story. A still has to create mood without sensory details a video has access to. JA: And why do you think documentation is important? GHG: We watch so much reality television today and are so caught up in glamour and what celebrities are doing despite the real issues we have to deal with. What’s going on in Kentucky that we don’t know about? What’s going on in South America? There’s massive upheaval in Brazil. The government is spending millions of dollars to build stadiums for the Olympics, and people are starving. But, in context, the average Joe doesn’t even know that that’s going on and needs to be informed. To me, that’s what documentation is about. Justin Allen is a northern Virginia native studying poetry at Eugene Lang College The New School for Liberal Arts. 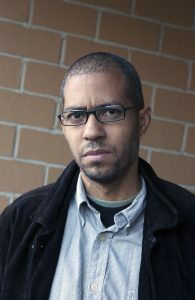 His writing has been featured on AFROPUNK, The Studio Museum in Harlem’s blog and queer culture blog Catch Fire. He also collaborates with friends Yulan Grant and Brandon Owens on BDGRMMR, a zine focused on queer artists of color. This entry was posted in Interviews and tagged André Leon Talley, Annie Leibovitz, Arbert Santana Evisu, ballroom, Ballroom Throwbacks, balls, dance, Danielle Revlon, Douglas Says, Eric Christian Bazaar, femme queens, Frank Roberts, gay, Gerald LaBeija, Gerard H. Gaskin, Henri Cartier-Bresson, Herb Ritts, homosexual, Jennie Livingston, Jennifer Evisu, Junior LaBeija, Justin Allen, Legendary: Inside the House Ballroom Scene, Madonna, Marc Ballroom, Marcel Christian, Mystery Dior, Octavia St. Laurent, pageants, Paris Dupree, Paris is Burning, transwomen, Vogue, voguing, YMCA. Bookmark the permalink.